Put Traveling with Pets to New Orleans on Your List. The Big Easy’s Nothing But Fun! 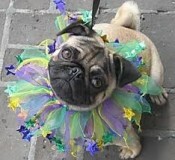 There are so many fun things to do with pets in New Orleans finding time to do them all is the hardest part. Oh New Orleans. If you’ve been there, you’re likely smiling and shaking your head right now. Is there a more festive place on earth than that Creole city by the Bayou? From Bourbon Street to the Garden District, hand grenades to beignets: New Orleans gets under your skin. If there was ever a place where the phrase “eat, drink and be merry,” defined a city, it would be New Orleans. Take all that revelry and debauchery and add in a good dash of voo doo and Cajun flavor and you’ve got beloved Nola. With all that’s on the table, doesn’t traveling with your pet to New Orleans sound like an intriguing adventure? New Orleans is another city that, by and large, can be walked. Especially if you’re staying in the French Quarter. Grab some water for your dog and a hurricane for yourself and hit the sidewalks to take in the architecture and atmosphere. While you’re out and about, stop at the world famous Café du Monde for a beignet. Dogs aren’t allowed on the covered patio, but if you can snag a seat outside, you’re good to go. Or if you can grab a table along the edge of the covered patio, Rover can hang out on the other side of the fence while you indulge in about 8,000 calories of sugary, doughy goodness. If Nola’s famous cocktails are more your thing, we’ve got it on good authority that the Bridge Lounge on Magazine is dog friendly and fun for both the pups and the people. During peak season, Bridge Lounge limits their dog friendly nights to one night a week, so be sure to check on the particular details before showing up with your hound. At certain times of year, bar owners get together and host a dog friendly pub tour, check with your hotel’s concierge to see if one is happening while you’re visiting the Crescent City. Historic New Orleans Walking Tours offers several New Orleans flavored walking tours that are leashed (and under owner’s control at all times) dog friendly. You can tour the swamp, you can do a cemetery and voodoo tour, you can tour plantation houses and the garden district, you can do a jazz tour – there are several fun and spooky tours to choose from. All these sights and activities are listed in our New Orleans Travel Guide. Vacation Pet Friendly has a huge directory of pet-friendly hotels, motels and bed and breakfasts on our site so reserve now! Booking through us gets you exclusive deals and discounts as well as sends a message to hotel proprietors that guests with dogs are great business! Whether you want to stay in the bustling French Quarter, the serene Garden District, or in Downtown Nola, Vacation Pet Friendly has a lodging to fit both your budget and your dog’s size. Check us out and please give us a call if you have any questions. Our friendly dog loving agents always love to hear from other dog lovers! Remember, booking early is essential when traveling with pets. See what’s available today so you get the best deals. Start your search for pet friendly hotels in New Orleans here. Then sit back and think of all the fun things you can do when you get there! Pet lovers, here is where Vacation Pet Friendly needs you. Have you been to New Orleans recently with your pet or noticed pets in bars and restaurants there? We would love to publish your tips!